The charter school sector is presently on the hot seat because many charter schools are highly segregated by race, and often more segregated than required by the demographics of their catchment areas. Such racial imbalance can happen when the student body of any particular school is based on a lottery among applicants to that school. This allows for self-sorting on racial, ethnic, and other dimensions. If the ability of parents to choose schools is a precondition for disproportionate concentrations of students of the same background in some schools, then it is important to examine school segregation in the context of school choice writ large. In many large school districts, parents are able to choose among traditional public schools, not just among charter or magnet schools. We know little about the effects of choice in this context. This report addresses that issue. The principal question is whether the degree of public school choice at the district level is associated with within district racial imbalance between school enrollment and the school-age population of individual schools’ geographical catchment areas. The analysis focuses on high schools in the 100+ largest U.S. public school districts. The principal finding is a substantive positive correlation between how friendly districts are to school choice and the degree to which their high schools are racially imbalanced for blacks and whites. In districts with low school quality, a common application for all schools, and that provide transportation for students to schools of choice, high schools, on average, over enroll black students. The same conditions of choice are associated with white under enrollment. School district choice policies are not associated with imbalance in the enrollment of Hispanic or Asian students. To the extent that school choice as presently implemented interferes with the goal of providing students of any particular group with meaningful exposure to students from other backgrounds, choice systems could be redesigned to produce more heterogeneous student bodies. This could be accomplished by using principles of behavioral economics to nudge applicants towards particular schools at the time of choice, and through school lotteries that provide extra points for applicants from underrepresented groups. While legally recognized racial segregation is a thing of the past, the de facto form remains very much with us. As my colleagues and I have reported, public schools have become more racially diverse in recent decades, largely as a product of a significant expansion of the Hispanic school age population. However, the segregation of white from black students has endured. As illustrated in the following figure, adapted from that previous report, the average white student’s public school had a black enrollment of about 10 percent in 2010, about the same degree of white exposure to blacks as in 1980. The average black student’s public school actually afforded less exposure to white students in 2010 than was the case in 1980.2 Growth in the proportion of Hispanics in the school age population and the related decline in the proportion of whites underlie some of the decline in black-white exposure. A critical issue with respect to the present prevalence and growth of racially segregated schools is whether education policies can ameliorate some of the impact of patterns of residential segregation that flow through to the public schools that serve segregated neighborhoods. If the demographics of schools are inextricably tied to the demographics of neighborhoods, then the goal of having racially and economically integrated schools will need to be achieved through changes in housing patterns – not quick, easy, or certain work. But to the degree that the public school a student attends can be disconnected from the neighborhood in which the student lives through public policy, there is the possibility of quicker and easier solutions than those that require building demographically diverse residential neighborhoods — further is the promise of a virtuous cycle in which severing the tie between place of residence and school assignment spurs the growth of diverse neighborhoods in areas that, save for the low quality of the local school, would be attractive places to live for families from many different backgrounds. In this light, examinations of racial imbalance in public schools would be more revealing if they took the totality of public school choice into account rather than focusing narrowly on charter schools. The tight connection between the different flavors of school choice is highlighted in those districts that deploy a common application for public schools of all types – charter, magnet, and traditional. The common application allows families to pick and choose among different types of public schools under the same rules and with the same information. We know very little empirically about the degree to which public school choice writ large is associated with changes in the racial balance of schools, and if an association exists, through what mechanisms it might operate. This report addresses that issue. The principal question is whether the degree of public school choice at the school district level is associated with racial imbalance between school enrollment and the school-age population of the geographical catchment areas of the district’s schools. In other words, compared with districts that still practice zip code assignment of students to schools, are districts with public school choice systems more or less likely to have schools that over represent black students and under represent white students (or vice-versa) relative to the surrounding neighborhoods? I address this question by combining and exploring relationships among variables in two large datasets that my colleagues and I at Brookings have assembled. The first is a database on the extent and characteristics of school choice in the nation’s 100+ largest school districts, as reported in the Education Choice and Competition Index (ECCI), the most recent version of which is found here.9 The second is a new database on school racial imbalance (SRI), described in this recent report, which provides measures of the extent to which each public school in the U.S. reflects the racial demographics of its surrounding neighborhood. 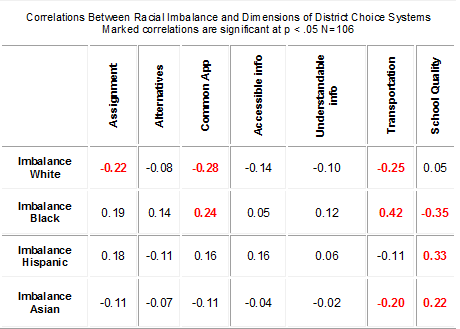 For the present analysis, I aggregate to the district level the data on racial imbalance at individual schools from the SRI and link it to the ECCI data on the choice systems of large districts. 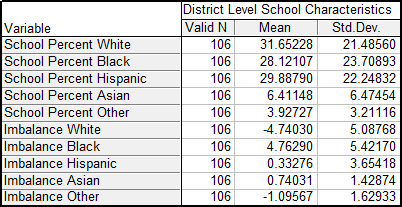 Using the SRI, I calculate the mean for each district of the difference for each high school between the percentage of students that is black and the percentage of the school age population in the surrounding two-mile area that is black.10 The equivalent measure is derived for whites and other racial groups. For example, if 60 percent of the students in a high school are white whereas the under-18 population in the surrounding two-mile area is 50 percent white, the school receives an imbalance score for whites of +10. But the same school with 60 percent white enrollment in a surrounding neighborhood that is 70 percent white would receive an imbalance score for whites of -10. The mean of these school-level values for each district tells us, for example, that a district with an imbalance score for any particular racial group that is positive has, on average, public high schools that over represent that group relative to their neighborhoods. The size of the imbalance score tells us the severity of this over-representation. Other approaches to examining school segregation in prior research rely on absolute numbers (e.g., a school is described as segregated because its enrollment is 90 percent black), or characterize a school’s enrollment as imbalanced relative to the demographics of the district or region (e.g., a school is described as segregated because its enrollment is 85 percent black whereas the district’s school age population is only 75 percent black). Such approaches frequently have no practical meaning. For example, an 85 percent enrollment for black students is not actionable if the population within reasonable commuting distance of the school is also 85 percent black. In contrast, the present approach produces measures that define racial imbalance relative to each school’s catchment area: a school that is 85 percent black in a neighborhood that is 65 percent black has a very different status in these measures than a school that is 85 percent black in a catchment area that is also 85 percent black. The balance between the demographics of a school and its catchment area is critically important notwithstanding the demographics of the district itself or the larger metropolitan area. For instance, the racial composition of the school age population of the entirety of New York City has little relevance to concerns about and efforts to improve the racial balance of schools on Staten Island, which by virtue of its geography might as well be a part of New Jersey. We need to know whether it is practically possible to improve the racial balance of a school, and this depends on comparison with local demographics. The ECCI generates scores at the district level on 13 dimensions of school choice. The present report incorporates seven of those 13 dimensions that are outward facing for students and families and most likely, conceptually, to play a role in their exercise of school choice: Alternatives to traditional schools, e.g., number of seats in charter schools; Assignment Process, i.e., the extent of school choice and its’ fairness; Common Application for traditional and charter schools; Accessibility of information on the choice process; Understandability of the information provided to parents on which to compare schools; Transportation to schools of choice; and School Quality in the district. ECCI dimensions that capture administrative processes that are not likely to be known or used by parents are excluded from the present research, e.g., whether the district has a policy for closing schools with declining enrollments. The complete list of ECCI scoring dimensions with brief explanations of each is available here. In that link, those used in the present analysis are numbered 1, 5, 6, 9, 11, 12, & 13. The figure below reveals a substantial and statistically significant correlation of 0.53 between district scores on the seven dimensions of school choice from the ECCI and district scores for high school racial imbalance for blacks and whites.11,12 In other words, districts with friendlier choice policies have high schools that are more racially imbalanced in terms of their white and black enrollments. The next table unpacks the omnibus measures of choice and racial imbalance represented in the graph by presenting the simple correlations between the district imbalance scores for each of four racial/ethnic groups and for each of the seven measures of district choice. The statistically significant correlations are marked in red and bold. 1. 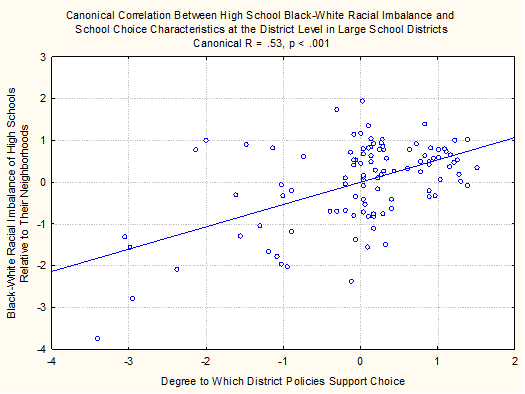 The associations between dimensions of school choice and racial imbalance are mirror images of each other for whites and for blacks in terms of the sign of the correlation. For example, districts that allow school choice through a common application have high schools with higher black concentrations than their catchment areas, but lower white concentrations than their catchment areas. A common application is a marker for districts with very choice friendly policies because the common app presupposes both open enrollment in traditional public schools and the presence of an appreciable number of charter schools. 2. The lack of a statistically significant association between racial imbalance scores for any group and the availability of alternatives to traditional public schools is consistent with the hypothesis that charter schools and affordable private schools are not a necessary component of choice-based racial imbalance in public schools. 3. Hispanic and Asian families with school age children do not appear to be much affected by district school choice policies whereas school choice generates a powerful dynamic for blacks and whites. 4. The information components of school choice systems, e.g., the ability to compare schools online and to see side-by-side information on school performance, do not appear to have much influence on school choices that generate racial imbalance. 5. District-level school quality, measured by how well students in each district perform on state tests, is a powerful correlate of racial imbalance in high schools for blacks. Every introductory course in research and statistics, as well as much popular science writing, includes the admonition that “correlation is not causation”. Even if it seems trite, it is worth repeating that warning here. The present analysis is based on observational data and correlational analysis. It does not support strong causal conclusions about the impact of district choice policies on racial segregation of schools. Rather, it explores associations among the variables that affect the ease of choosing schools, on the one hand, and the degree of racial imbalance in schools, on the other. This type of exercise can be useful as a first step in the examination of phenomena about which little is known. Much more work will need to be done, starting with additional correlational analyses and moving towards research designs that support causal conclusions, before the associations in the present support can be verified and interpreted with confidence. That said, the pattern of associations reported here is consistent with the hypothesis that school district policies that allow parents to easily choose a school for their children can lead to schools that are more segregated than would be the case if school assignment were based entirely on zip code. The present demonstration of an association between school choice and school segregation also aligns with the recent report by my colleagues and I that charter schools, which are always schools of choice, have a substantially higher racial imbalance relative to their catchment area than traditional schools, which typically serve students assigned to them based on their families place of residence.17 In this regard, the mean racial imbalance score in traditional public schools for black students is +1.6 percent whereas in charters it is +5.7 percent. As I indicated previously, there is a lot of evidence that racial/ethnic groups prefer to live in areas in which their own group predominates, and that racial composition is very important when families search for schools. In that context, it would be surprising if school choice, which allows families to act on their preferences for schools, including their racial composition, did not to lead to more self-sorting by race/ethnicity in at least some cases. After all, if students are assigned to the public school that is closest to where they live there cannot be a meaningful imbalance between the demographics of the student population of a school and that of the catchment area for that school (other than as a result of differential use of private schools and quirks in how the catchment area is identified). Thus, school racial imbalance as conceptualized and measured in the present report requires school choice. The possibility that school choice opens the door to more segregated schools does not lead directly to particular policies. This is because most policy choices involve competing values and outcomes. For example, those arguing for a return to zip code assignment of students to schools because such schools are somewhat more likely to be racially balanced than schools of choice have to discount: 1) the strong preference of parents to choose their children’s schools, 2) the likelihood in some districts that a voluntarily segregated school of choice will provide a much better education than a child’s marginally less segregated neighborhood school, and 3) the impacts of the competition among education providers that occurs when school enrollment is determined by choice. My preference in terms of policies that aim to produce more racially and economically diverse schools is versions of school choice that are modified for that purpose. Whereas present choice systems that are viewed as models for other districts to emulate are designed to achieve the closest possible match between parental preference and school assignment, future choice systems might be redesigned to obtain greater diversity in school-level student populations. The possibility that unconstrained school choice leads to more segregated schools is consistent with the findings in this report. The nation is very likely to be better served in the long term by public schools that afford students the opportunity to be exposed to peers from a diverse set of backgrounds. School choice is surely not the dominant determinant of segregated schools. In fact, we are becoming a nation of virtual and real gated communities in which people self-sort based on similarities in education, race, culture, and affluence.21 The public schools reflect this larger trend. To the extent that school choice increases rather than reduces school segregation, there is work to be done. The SRI dataset reports separately for each borough of New York City. Those results are aggregated in the present analysis to generate imbalance scores for New York City as a whole in order to match the treatment of NYC in the ECCI. Four other districts in the ECCI could not be matched with data in the school racial imbalance dataset because their organizational structure no longer lends itself to a district characterization, e.g., neither Detroit nor New Orleans has a district identifier in the most recent federal common core of data from which the SRI dataset draws. High schools rather than all schools are used because choice is more likely to be available for high school students than students in middle or elementary school. The choice of a two-mile area to define a school’s catchment zone rather than an area with bigger or smaller or differently defined geographical area is explained in https://www.brookings.edu/research/60-years-after-brown-v-board-of-education-how-racially-balanced-are-americas-public-schools/ . The statistical technique underlying the graph, called canonical correlation, has the advantage for the present purpose of collapsing the seven separate ECCI scores into a single number for each district, and likewise combining into a single score the separate measures of racial imbalance for whites and for blacks. It does this by finding weights for the variables in each set that result in the maximum correlation between the two sets. We end up with two latent variables, with the predictor being the degree to which districts have policies and circumstances supporting school choice as measured by the ECCI, and the dependent variable being the extent of white-black racial imbalance in high schools in each district as captured by the SRI. Imbalance scores for Hispanics, Asians, and Others are excluded from the analysis underlying the figure because school choice policies are very weakly related, if at all, to imbalance scores for these groups in the present data. Whites and blacks can be over- or underrepresented in public schools and relative to each other at the district level for a number of reasons. For example, if whites are more likely than blacks to enroll in private schools, whites will have a negative imbalance in public schools. This would lead mechanically to over representation of blacks in public schools because the total enrollment denominator for public schools shrinks whereas the numerator of enrollment of blacks does not. Differences in school size that are correlated with the demographics of the catchment area for schools can also play a role in imbalance means for each district. Charles Murray (2012). Coming Apart: The State of White America, 1960-2010. New York: Crown Publishing Group.